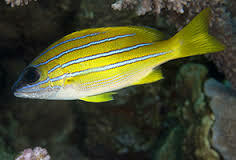 One of the most widespread of the snappers, the Bluestripe Snapper, also known as the Blue-Line Sea Perch, ranges from the Red Sea south to Madagascar and east to India, Asia, Indonesia, Australia and a number of Pacific Islands including Hawaii. 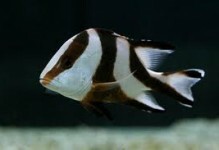 Your specimen will be from Fiji, Indonesia, or Maldives, and make a hardy and rewarding edition to your FOWLR aquarium. 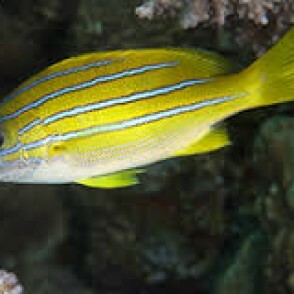 The Bluestripe Snapper’s body is moderately deep in profile, with a distinctly steeply-sloped head. The back and sides of the fish are bright yellow, while the underside fades to white, presumably as camouflage to disappear against the bright ocean surface when viewed from below. 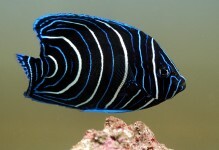 Four bright-blue stripes run lengthwise across the side of the fish, with several faint greyish stripes on the lowermost part of sides. 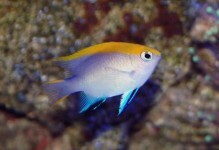 The Bluestripe Snapper is a schooling fish and should be housed with 3 or more tank mates. 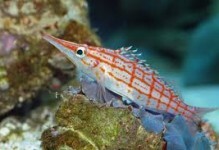 The Bluestripe Snapper should be offered a diet of meaty foods such as chopped frozen silversides, krill, vitamin-enriched brine and mysis shrimp along with other carnivore preparations.